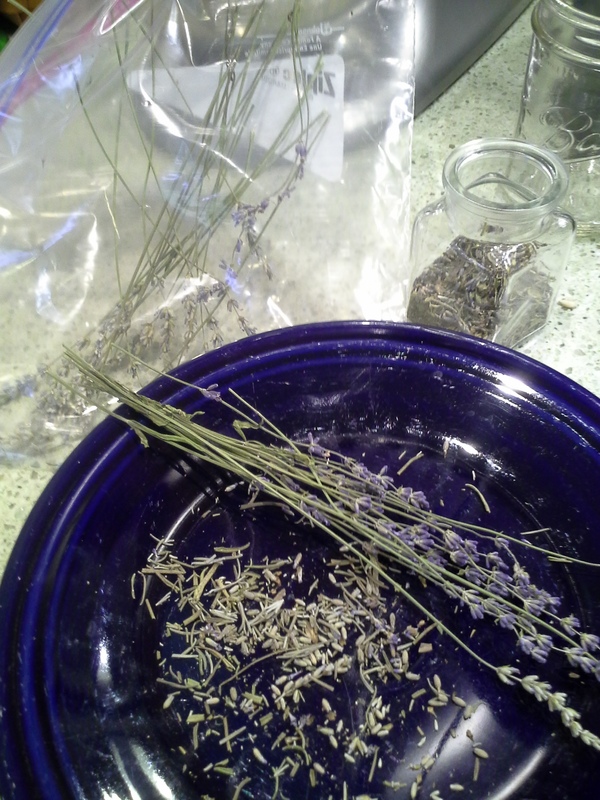 Today I picked a lot of herbs hoping to really use the summer’s growth instead of just the fraction I have in the past. 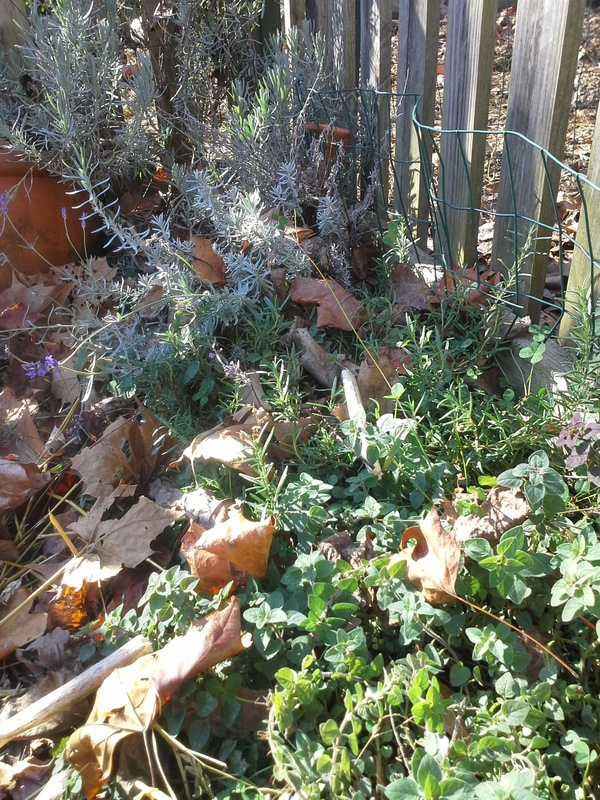 It’s a bright sunny day in early November, and the little I know about herbs is that you should pick them in the morning, and on a dry day. 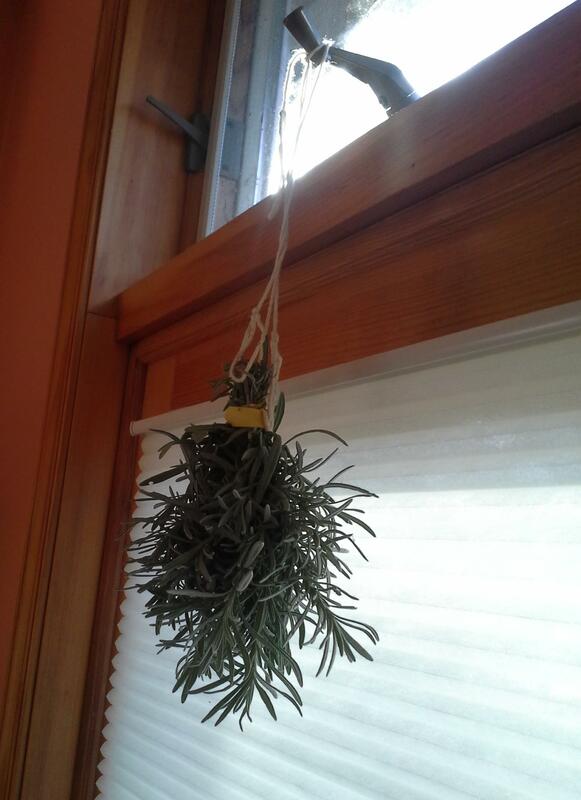 During the summer I picked some herbs and dried them in my old way, hanging bunches upside down out of the sunlight until they were crunchy. You want to avoid sunlight because it will bleach out color and flavor, but you want to pick a place that has some light and good air movement, so they dry quickly and don’t mold instead. I tried out drying some in the dehydrator we bought (used from Amazon) for drying fruit. Herbs done this way were ready much faster of course, and also it was reliable even in humid Maryland summer weather. 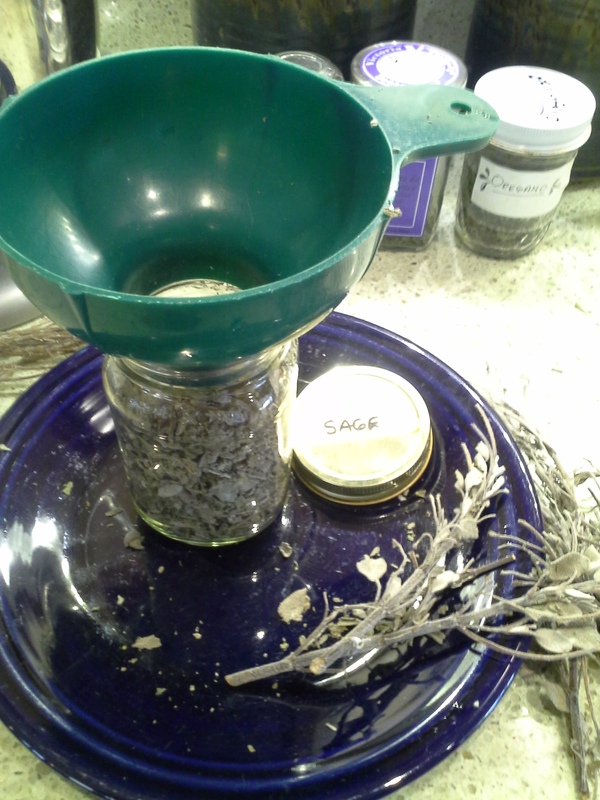 Although I enjoy the job of crumpling the dried herbs off their branches and bottling them up, I tend to put it off — and off — so those hanging bunches can get kind of dusty. 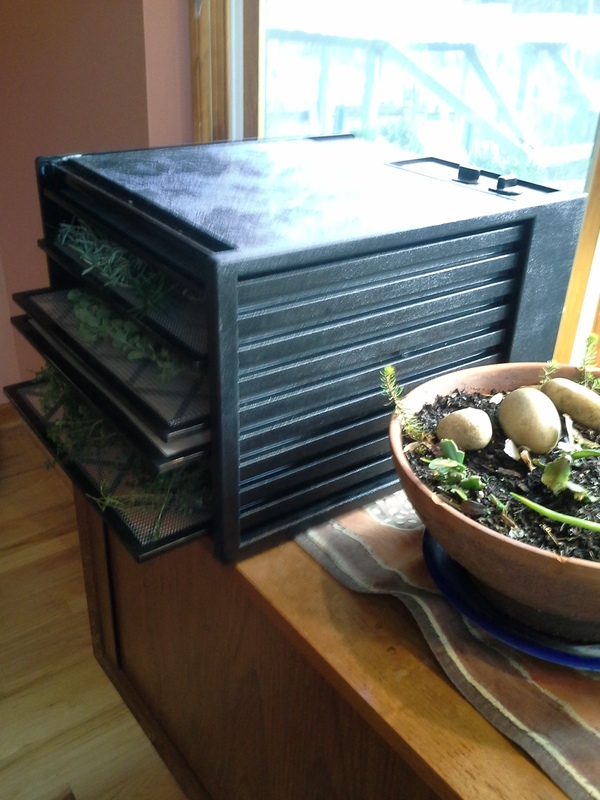 To avoid the avoidance, I stored my dried herb bunches in ziplock bags this season as I went along, planing to process them when the press of summer gardening demands lightened up. Today I began to process those bags — WOW what a fragrance! – rubbing the leaves and branches inside the bag, and then with my fingers, pouring them through a funnel into glass jars. There they wait to become stews, soups, season baked chicken, etc. I use a lot of herbs when I cook. Naturally you want to store the jars of herbs out of sunlight also. 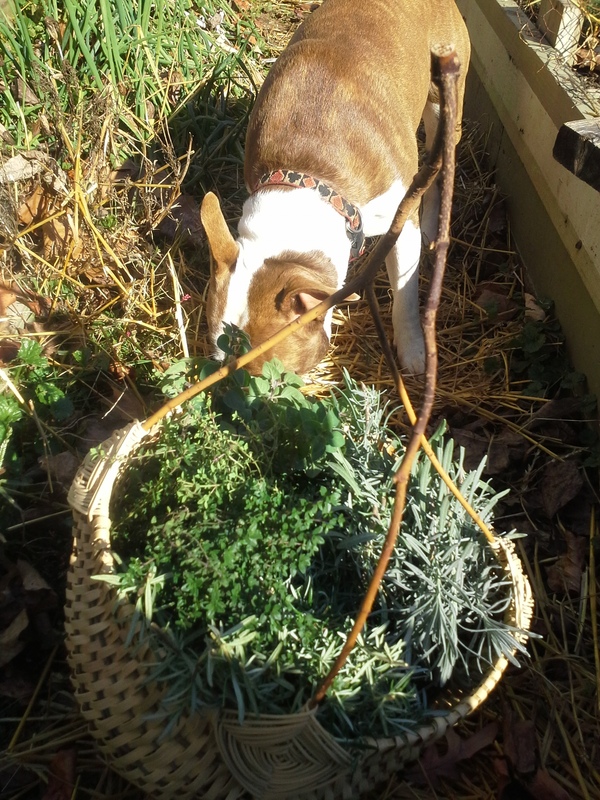 Since herbs grow very easily it makes sense to grow our own, which are fresher and potent beyond belief, organic without trying, and almost free compared to store bought. During the summer I use them in their fresh, and also semi-dried state stealing from the drying bunches — but it sure is handy to have them inside when I need them! I should never imagine that it will be so Martha Stewart al fresco to run outside and harvest them right when I need to be getting a meal on in a hurry. So I am glad that writing this blog reminded me to put them in jars for the winter. Every year I get a little better at taking full advantage of what my suburban gardens can bring to our table. Every year there is more to bring.